Restrictive Covenants were legally binding parts of suburban house deeds that restricted any people of color from legally buying a home. It restricted white home owners from selling their home to anyone that was of a different race. Homeowners risk having their property turned over to the bank if they do not comply with these racist contracts. 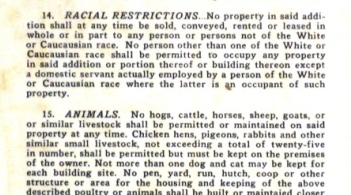 Racially restrictive covenants were used during early urban development periods, from the 1920’s up to the late 1940’s. They were used in a combination of racially-dividing tools to prevent suburbs from becoming heterogeneous to maintain a high property value. FHA backed mortgages, redlining, racial steering, and block busting were all methods alongside restrictive covenants in practice for maintaining white homogeneity in suburbs. Although we see this as overt racism, back when it was practiced it was more of a response to the idea that poverty was a pathology; that non-whites had a higher risk of being poor and thus reducing the property value around them. The idea that people of color diminished property value is, obviously, racist. But it also discourages white people from interacting with POC, and it also showed that there was a clear lack of opportunity for POC to achieve the “American Dream” by being restricted from buying suburban homes. In 1948, the Supreme Court of the United States deemed this practice as unconstitutional, and major cities and their surrounding suburbs began ridding their property deeds of the racist covenants.